you could end up making matter's worse or break the small SMT pot. 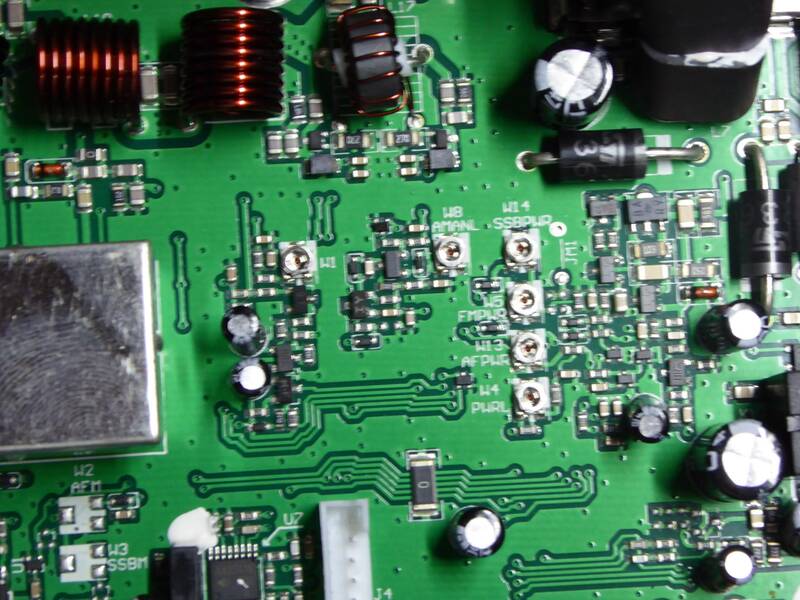 the SSB ALC and the AM modulation low power\high power control end. Its not a simple case of turn a pot down on these radios. id rather have 40W pep clean radio,than 100w dirty,harmonics from some of these CB amps ive seen with no low pass filtering. Bear in mind that 40w pep VS 100W pep is roughly just over +3dB gain,thats half an S-point! Going Off Topic sorry,but is related to these radios being high power! if lowdown at sea level and hill surround-antenna max height above roof ,use a quarter wave ground plane for high angle of radiation to get your signals over mountainous,houses,buildings ,tress-typical wales! Biggest mistake I often see is large half wave.5/8th wave antenna mounted far too low to ground and surrounding area for line of sight comms on CB,its basically VHF with a sprinkle of HF prorogation when time right. Yes you have to pay,but least know its all setup correctly and shouldn't cause problems. and cause other issues to neighbors TV,equipment,we all know this is naughty,but id rather have operator's who do this stuff the right way than the wrong way and cause more harm and annoyance on band,thats how CB radio got some of its bad image press in early days! If you got test equipment i maybe able to help you,if not dont attempt yourself,take it too a professional to setup right best option. Currently Im to busy with other projects and personal matter's to deal with right now to help step in, at the moment. The power shouldn't be that high anyway. It won't do the output transistors any good so it would be a good idea to reduce the RF power internally and further control that from the front of the radio (the variable power should work on all modes).